Mobile My Quotes on the large iPad screen is full of features that make print estimating with your clients fast and fun. The Multi-Touch Precision interface gives you the control to make the perfect printing quote to your client while hiding your wholesale cost of printing. The mark up editor allows you to set your own custom mark up and only display the retail price to your clients when generating a quote from thousands on available print products. 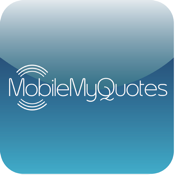 And discover many other features — from custom mark up to lighting fast custom quotes — that make Mobile My Quotes on iPad an amazing experience.